"Yep, Indian Summer," said one of my colleagues, "Earthquake Weather!" All of the workers agreed that earthquakes occur most frequently on warm days in the fall, during Indian Summers, and we wondered what might cause it. Sudden cooling and then warming of the earth's crust, or something like that? That afternoon the owner of the place was supervising us directly, and he would have none of it. Like he was talking to superstitious children, he said "Earthquakes happen deep inside the earth! The weather doesn't reach down there! Nothing does!" He insisted that we were repeating a mistake that was as old as Aristotle. from 384 to 322 B.C. Was he right? Probably. Two thousand years ago Aristotle said that earthquakes are most common on warm days in the fall, but since then not one scientist has published anything to confirm it. Still, the question has nagged at me since then, and if Aristotle still stands alone, there is now evidence that events on the surface can change things deep in the earth, albeit in a different way. Some of our readers already know that the surface of the earth is divided into a series of zones, according to the climate. They also know that hot air rises, and that the equator is usually the hottest part of the earth. This heat causes two things to happen. First, the heat evaporates water, so that vapor rises off the lakes and the sea; and second, the heat makes air hold more water. These two things fill the air with water and ensure that the equatorial zone is humid and muggy. Secondly, most readers probably know that hot air rises, so the hot wet air at the equator go up until it reaches the middle of the atmosphere, where it gets cold. When warm air becomes cold, the air molecules stop moving as quickly, and the air pressure falls. When air pressure falls, air loses some of its ability to hold water. If the air pressure falls far enough, water starts to drop out of the air completely. We have all seen this, of course, many times. For instance, when we get into a car on a cold day our breath often reaches the cold window. Our breath is warm and full of water vapor from our lungs, but when it reaches the glass the same gas will become cold, lowering the pressure and causing water to condense, so it forms a thin layer on the glass. Houses give an even more dramatic example of the same phenomena. In the winter, a warm house can have so much vapor in the air that it condenses on the window and forms droplets, which run down the inside of the window like tears. The same thing happens in the atmosphere. Once the warm wet air reaches the colder parts of the atmosphere, the water condenses and rain begins, often falling all the way back to the ground. This is why the area around the equator is so damp. Rain cascades over Brazil and Congo and the Philippines, and the middle quarter of the world is usually wet. When I was a boy, people were still saying that what goes up must come down. A few astronomers might disagree, but generally this is true; and the air which reaches the top of the atmosphere becomes cold and heavy, and ready to sink back to the ground. However, the air that rises over the equator does not come back down over the equator, because more air is always rising there. Instead, the cool air is pushed north or south, into a different band over the earth. This air starts out cold at the top of the sky and then becomes hotter as it descends. As a result, the hot air does not lose water; instead, the pressure rises and the humidity falls, so that the air gains the ability to soak up more water, like a big dry sponge. This air then comes down, over Mongolia and Mexico and the wide Sahara, so these areas not only get little rain, they become drier. Thus, if the world were an Easter egg, the middle stripe would be green and wet, but the stripes above and below it would be brown and dry, the color of the plains in South Africa and Australia and Argentina, as latitude controls climate. Of course, the dry air eventually makes it to the ground, where it begins to flow back to the equator and begin the process all over again. Fortunately, this dry air does not extend all the way to the pivots of the world. Beyond certain latitudes another set of bands begin, which we call the temperate zones. 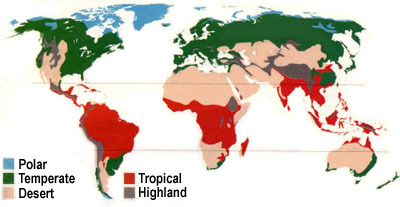 The northern temperate zone contains Siberia and Europe and the northern part of our own continent, while on the other side of the world, the southern temperate zone holds New Zealand and the southern tips of South American and Australia. Now, some people may wonder what that has to do with geology. Don't worry, the payoff is coming. As we said, a large part of the world is usually dry. The presence of mountains stop clouds from entering the interior of some continents, making them dryer, and the presence of bays or lakes may make the air cooler or more humid, making it wetter, but the zones we have discussed are created by the geometry of a sphere, and so they last much longer than mountains or lakes or ocean currents, and latitude always influences the weather. And this brings us to the Andes Mountains. Most readers already know that the Andes Mountains run along the western coast of the South American continent, from the very top to the bottom of the continent, and this means that the Andes mountains run right through three climate zones. At the top, the Andes run right through the equatorial region, in the middle, the Andes run right through the dry zone, and at the bottom, the Andes almost reach the Antarctic, where the climate is cool and wet. Thus, the northern end of the Andes has always been 'in the rain', the middle has always stood over a desert, and the southern end has always been damp. And this has changed the mountains. To understand why this is so, we have to remember how mountains are formed. The Andes exist because the floor of the Pacific is always in motion. The center of the earth is always hot because the center of the earth contains minor amounts of uranium and other radioactive metals. These materials decay slowly, but they do decay, and the heat from their decay has nowhere to go but up; so this heat accumulates across thousands of miles of metal, until the earth contains enough heat to melt iron and keep it melted. Furthermore, hot iron rises through cold iron the way boiling water rises through cooler water or hot air rises through the equator. The hot iron rises until it reaches the earth's crust. This is good for us, because the rising iron joins together with the heat of the sun and makes the surface of the earth warm enough to melt water and to let grass grow. Nonetheless, the iron inside the earth cools after it touches the crust, the way the air cools after it reaches the top of the atmosphere, and the cooler iron starts to descend again. The result is a rotary motion, a cycle going up and then down, like the wheel of a bicycle. Let us try to get a picture of that. Think about a pot of water on the top of a stove. As the pot heats up, water will start rising from the center. However, the water will be too heavy to escape from the pot, so it will cool a little bit as it reaches the surface; and then that water will be pushed aside by more water coming from the center again. Looking at the water it will seem to roll, to reach a rolling boil; and as the water rolls it will push things on the top of the water towards the edges. For instance, if there are beans floating in the pot, the beans will be pushed to the edge of the pot, until they form a ring around the inside. The earth is the same way. As the lava reaches the underside of the crust and then rolls back down, the lava pushes the crust along. 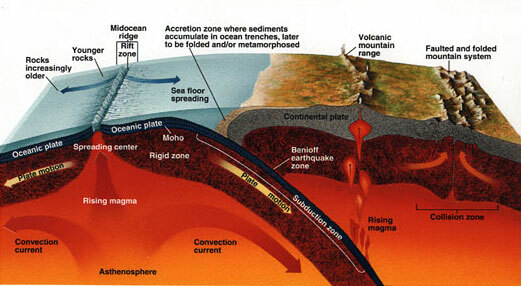 For instance, underneath the Pacific ocean the lava is rising underneath the mid-oceanic ridge. Sometimes the lava breaks through, creating volcanoes and islands; at other times the lava just pushes the underside of the crust towards South America, so that thousands of miles of cold black sea bed are ramming into South America, at the rate of inches a year, but with the colossal force of trillions of tons of rock. Now, lets think about what happens when that seabed strikes the underside of the South American continent. The continent itself is made of granite, a mineral containing a lot of silicon, and the continent is lighter than the sea bed, which also has silicon, but a lot of iron as well. At the same time the sea bed starts out lower than the continent -- after all, it is under the sea, while the continent is higher than sea level, or else no one would call it a continent. When these two meet, both have to bend; but the seabed goes down, pushed down into the lava under the earth, while the continent is pushed up. To understand that, we might use another image. Think of a throw rug laying on a smooth wooden floor. The throw rug can be the continent, if we wish. Then, think of a plastic mat laying on that same floor. If we push the mat towards the rug, the two items might just bunch up at the sides, making a series of folds that look like mountain ranges, or the plastic sheet, being lower, might slide under the rug; but even then the rug will be pushed up, making a series of ridges which look like mountain ranges. That is how the Pacific seabed is sliding under South America, forcing up the Andes mountains and making them higher every year. Now some people are probably wondering what that has to do with the weather. However, a pair of scientists have recently shown that climate does influence how mountains grow. Writing in this month's Science Magazine, Simon Lamb, an earth scientist at the University of Oxford in England, and his colleague Paul Davis, a geologist at the University of California, Los Angeles, have proved that not every corner of the seabed is created equal. Instead, some parts of the seabed are more slippery than others. After all, the seabed starts out as hard, igneous rock, lava that rose from the center of the earth and got hard when it contacted the cold water of sea. The surface of that rock will be rough and create a lot of friction when it slides under something else which is rough, such as the underside of South America. However, some parts of the seabed are not as rough, because those regions are covered with mud and silt. This mud and silt come from rivers, which pour onto the seabed from parts of the continent which get decent levels of rain. These parts of the seabed slide under the continent with less friction, and so they create less bunching. We have come something of a distance here, but I hope it is clear. The northern part of the Andes runs through the equator, where there is more rain. Where there is more rain, there are more rivers, and where there are more rivers, there is more silt. As a result, the seabed gets slicker, and therefore the seabed slides under the continent more easily, causing less bunching. The middle of the Andes ranges runs through the dry zone that we talked about earlier, so there are fewer rivers and less silt. The seabed gets less lubrication this way, so there is more friction where it contacts the underside of South America, and more bunching. Therefore, the mountains in the middle of the range are twice as high as the mountains in the northern part. Then, if we go further south towards the Antarctic, the climate is wetter, the rivers carry more silt, and the sea bed causes less folding in the continent above it. At the southern end of the Andes the mountains again become lower. We are used to seeing geology control weather, when mountains stop rain from reaching entire regions of the earth, and I suppose we all know how rivers carve valleys. Nonetheless, this is the first time science has shown the weather affecting events deep under the earth's crust. Who knows? Someday, perhaps, science will find a way to vindicate Aristotle as well, but I do not expect it any time soon.